The blue mosque is stunning inside and out. Ironically, we like this image in black & white in contrast to its colorful name! The Blue Mosque in Istanbul, Turkey was one of our favorite stops in this world class city. Truly a spiritual epi-center, Blue Mosque is often overlooked by the world famous religious building right next door: the Hagia Sophia. While the history and evolution of the Hagia Sophia is astonishing, the Blue Mosque has quite a history and stunning appearance of it’s own. In fact, we think it’s much prettier from the outside than the Hagia Sophia. The colorful name was chosen for the ornate blue Islamic artwork carved, painted, and plentiful throughout the sacred building. Even with hundreds of other tourists and religious pilgrims walking around the Blue Mosque, the respected silence and calm energy made us feel as if we were the only ones there! Istanbul is one of the most visited cities in the world just behind Paris and for good reason. Our travel club will be going back again and again on our group tours to Turkey. THis is a lovely photo. 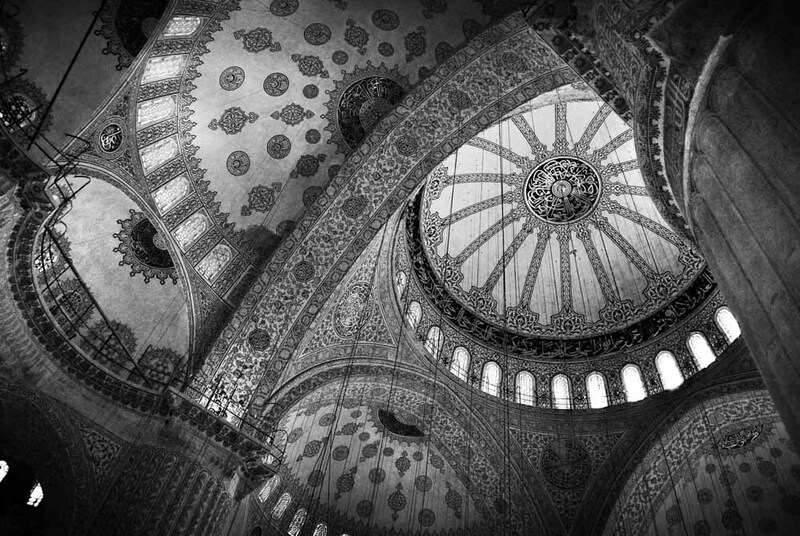 I found it really difficult to take decent photos inside the Blue Mosque – mine are nothing like this! Yeah it can be a tough place to capture. We got lucky!